Alien Skin Software has announced the latest version of their Lightroom competitor, Exposure X3. The all-in-one photo editor and organizer offers non-destructive raw editing and the upcoming X3 update will include creative enhancements and workflow improvements. Exposure X3 includes color and black and white toning enhancements, including greater user control. The new "blacks" and "whites" sliders are also available within the new five-section histogram. There's a new side-by-side view that allows you to compare similar images or the same image with different presets and edits applied. Exposure X3 has new link view functionality, meaning that you can zoom in or pan across one image while the software maintains a like view on the images you're comparing. For example, if you're viewing one image at 100%, you can view that same area of up to three other images at 100% at the same time. Selective edits have been improved with new linear and radial brush shapes as well. On the organizational side of things, Exposure X3 now includes virtual copies for editing multiple versions of the same image without using up more storage. Further, you can now add keywords to your images, which are stored in the metadata of your files. You can create keyword sets to group like keywords as well. For fans of collections, X3 represents a big improvement as it now supports advanced collections tools. These improvements allow for X3 to perform better as standalone software. Exposure X3 will also be available as part of a bundle with Alien Skin's Blow Up and Snap Art software. We hope to go hands-on with Alien Skin Exposure X3 ahead of its release in Q3 2017. Exposure X3 will be available for $149. For users who purchased Exposure X2 on or after September 1, Exposure X3 will be available as a free upgrade. 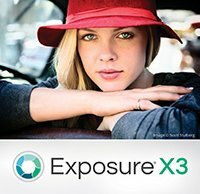 Owners of previous Exposure versions can upgrade to Exposure X3 for $99. You can also purchase Exposure X3 as part of a bundle, which includes Alien Skin's award-winning Blow Up and Snap Art tools. A 30-day fully-featured Exposure X3 free trial will be available at release. You can learn more at Alien Skin.